A modern-day Carnie enjoying an ethnic past-time. For those without comedic tastes, the so-called experts at Wikipedia have an article about Carnies. Carnies are a nomadic people that originated on the steppes of Central Asia. Long known to the West for their seemingly strange customs and frequent wars with Muscovy’s infant Czarist kingdoms (and, later, the Russian Empire), Carnies have been instrumental in both the shaping of world history and the advancement of games based upon throwing balls into or at something from three to six feet away. 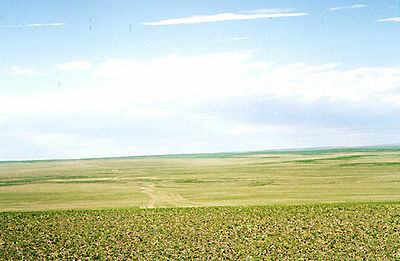 The beautiful steppes of Central Asia. Archeological evidence suggests that Carnies originated on the steppes of Central Asia. Like most nomadic peoples, Carnie society depended heavily upon a tribal- or clan-based system. In the case of Carnies, a clan was known as a Carnival, and a group of many Carnivals in one place was known as a County Fair. Because Carnies never developed their own system of written language, and only adopted Cyrillic script in the 10th century, not much is known about their early history. What little that is known comes from surviving first-hand accounts of travelers from other societies. I and my companion, Gaius Octavius, came upon a band of barbarians on our way to the Orient. We saw that they had goods with them, but they were overpriced, and of dubious quality, so we passed the nomads by. As we passed, the nomads all began chanting strange things, and in an odd cadence, as though they were beseeching us to buy from them. ‘GET your red-wine-here,’ they seemed to be saying. I pressed on, but Gaius relented and purchased a strange bread cooked in the liquid fat of animals, and for far too many coins. It went bad the next day. To the West there exist nomadic barbarians with customs most backward and uncivilized. If a man wishes to purchase a horse, he may not just buy the horse outright, but must instead pay a great deal more than the horse is worth, and then play a game where balls are thrown at something. If one loses the game one does not get the beast, and must then pay once more to attempt to play the game again. This manner of trade is most inauspicious for the buyer. With the fall of the Roman Empire and the perpetual decline of its successor state the Byzantine Empire, contact between Carnies and Western societies became increasingly rare throughout the whole of the first millennium. Indeed, Carnistan would not interact meaningfully with the West again until 1348, when Italian merchants brought back goods from Carnistan to Genoa. Also aboard the ships were rats from Carnistan that carried the Bubonic Plague—millions died, and it would be another 450 years before any major nation bothered with Carnistan again. This 17th century oil painting depicts Carnies fleeing the scene of a raid. In the early 1600s, Czarist Russia began in earnest its dreams of continent-wide expansion. Upon running into the militaristic Prussians in the west and the numerous Chinese in the east at around 1750, this aggressive expansion was directed southward to the relatively easy pickings of Central Asia. What followed ranks among the bloodiest chapters in world history, as Imperial Russian troops attempted to take the whole of the world heartland for the Czar. Our unit set up camp near large Carnie outpost. When order came to move we formed straight line with guns. We shot guns into group of Carnies and saw nothing. Carnies made odd device from metal which had many colored spheres that would float on air like bubbles. We shot bullets and spheres destroyed and made loud noise. When noise was at end one Carnie with unruly beard came forward and told private next to me that he had ‘won.’ Our platoon shot him many times but another Carnie came. Carnies kept coming. Continued for many minutes. Our unit experienced great fear at them and was made to retreat. 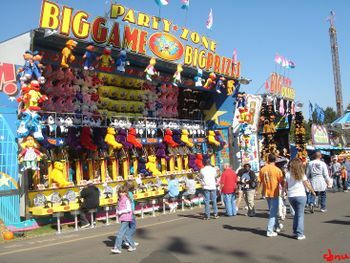 As unit fled Carnies threw stuffed lifeless animals of unnatural color and shouted things. Unit very scared. After four years of bloody warfare, Carnistan was finally pacified by Czarist troops and annexed into the Russian Empire. The struggle of Carnistan against the Russians is one of the many lost chapters in the history of Central Asia: while the hardships of other steppe peoples against the Russians are often remembered,  those of Carnistan were never afforded such reverence or attention. Soviet dictator Josef Stalin declared all Carnies to be enemies of the people on December 9th, 1931. The plight of the Carnies and their nation would get no less severe after the Russian Revolution in 1917. With the ascendency of Stalin to the seat of Soviet power came oppression and repression on a scale hitherto unprecedented in Central Asian history. On December 9th, 1931, in one of the Soviet dictator’s infamous Breakfast Directives, Josef Stalin ordered the entire nation of Carnistan forcibly transferred to Siberia to make way for gulags meant to hold Lithuanian political dissidents. This forceful ethnic relocation served as the impetus for the most important event in modern Carnie history: the Carnie Diaspora. Rather than accept relocation, a large portion of Carnies opted to leave the Soviet Union. Most traveled westward toward the Balkans, but the high proportion of Gypsies there already filled the region’s “culturally-backward-bottom-rung-of-society” niche, forcing most of the Carnies that came to wander further. Today most Carnies reside in the American South, one of the few places in the world where they can get along in society despite their low levels of education. Carnies there continue their nomadic lifestyle, moving town to town, setting up Carnivals wherever they decide to temporarily settle. The arrival of a band of Carnies is cause for great stir, especially in smaller towns, and residents will flock to the Carnival to spend their hard-earned money on such necessities as hotdogs and as-seen-on-TV products. Though it has evolved a great deal over the last few centuries, the foundations of Carnie culture remain firmly in place: an affinity for fried food, a deep appreciation for the art of throwing balls at things, and a collective inability to price things under $5.00. Carnie men settling matters of trade, justice, and love. In stark contrast to most steppe peoples, Carnies frown upon haggling in all of its forms. Instead, trade is conducted in a manner that would seem odd to most outside observers: according to games played by throwing balls at things. These games range from throwing balls into something to throwing balls on top of something to throwing balls at something to knock it off the top of something else. In the context of trade, these games act as a sort of check of intent: if the buyer is good and trustworthy, he or she will be able to win the game, and buy the good in question. In stark contrast to most steppe peoples, Carnies frown upon jury trial in all of its forms. Instead, the question of determining guilt or innocence is resolved in a manner that would seem odd to most outside observers: by games played by throwing balls at things. These games range from throwing balls into something to throwing balls on top of something to throwing balls at something to knock it off the top of something else. In the context of determining justice, these games act as a sort of moral test: if the accused is good and trustworthy, he or she will be able to win the game, and in the process determine their innocence and good conscience. In stark contrast to most steppe peoples, Carnies frown upon courtship in all of its forms. Instead, nuptial agreements are arrived at in a manner that would seem odd to most outside observers: by games played by throwing balls at things. These games range from throwing balls into something to throwing balls on top of something to throwing balls at something to knock it off the top of something else. In the context of love and potential marriage, these games act as a sort of husbandry indication: if the suitor is fit and tenacious enough, he will be able to win the game, and, by extension, the hand of an elder’s daughter in marriage. Fried dough is the staple of Carnie cuisine, and, surprisingly, it has even more trans fats than its name would indicate. Though it is comprised of little more than yeast dough seared in animal lard, the relative simplicity of fried dough means any number of culinary amenities can be added to taste, though these amenities typically take the form of sugar that has been powered, granulated, or browned in some way per tradition. Fried dough is cooked in large family-owned fryers: the operation of these fryers is a responsibility and art that is passed down to the oldest child upon their reaching maturation. In a moderately sized Carnival, as many as two dozen separate Carnie families may produce and sell fried dough as their form of sustenance. A relatively new addition to Carnie cuisine, kettle corn was developed in the 1400s when New World vegetables were introduced to Eurasia. It is cooked in the same manner one cooks popcorn, though—as with most Carnie dishes—absurd amounts of sugar and sugar-based sweeteners are added. Among the rarest of Carnie delicacies, the flowering onion is known for its beauty and its difficulty in preparation. The process actually used to make the onion “flower” is a closely guarded secret, and according to tradition is only revealed to the most skilled apprentices of Carnie chefs. 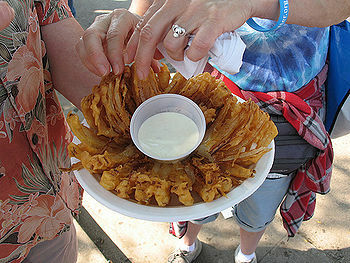 As a result, flowering onions are among the most expensive and sought-after dishes in all of Carnie cuisine, with wealthy patrons often paying thousands of dollars for a properly flowered onion. 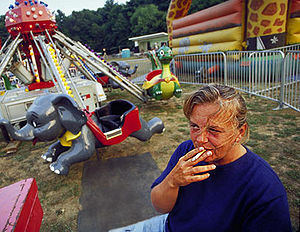 ↑ Even today, the vast majority of Carnies are completely illiterate. Most knowledge—like working the family deep-fryers or determining if someone, in fact, “got it”—are passed down orally from generation to generation. ↑ The lack of Carnivals was just one more reason why the Dark Ages sucked. ↑ Or Czarina, depending on the time period. ↑ And that’s really saying something. ↑ The Tatars have a sauce named after them, for instance. ↑ Come to think of it, nobody’s life got less severe after the Russian Revolution. ↑ Every morning before breakfast, Stalin would pick one of the USSR’s many ethnic minorities to systematically oppress that day. ↑ But suspiciously little compared to other, better cultures. ↑ As a result, many European countries—notably Italy and Ireland—revamped their cuisines.